The members of She Swings, She Sways were all born in Iowa and raised within 30 miles of each other. Nobody could have known that beginning in 2005, the only thing separating them would be the number of trips they’ve each taken around the sun. She Swings, She Sways coalesced in the only apartment building in downtown Ottumwa, Southeast Iowa’s post-industrial wasteland, when an acoustic duo (John Gordon & Cory Canny) met long-time drums and bullfiddle rhythm section (Jason Bolinger & Troy Morgan). Drawing on over 30 years of combined experience, the band began writing, recording, and performing in 2005. 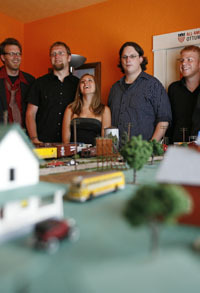 In 2007, the band added two new players—Wes VanAntwerp (electric guitar) and Diana Garles (keys, vocals, trumpet). Since then, She Swings, She Sways has spent almost every minute together – sharing a house and completing five tours of the Midwest, playing over 200 shows. Their travels have resulted in many new friends and fans; a few broken hearts; and the rescue of Sassafras, a horse stuck in a frozen Kansas pond. And even though the road can be hard, they’re always able to find a girl’s bed to sleep in (though she may not be in it), and her mom usually makes them muffins in the morning. She Swings, She Sways released a self-titled EP in the winter of 2005, which was quickly snatched up by audiences across the Midwest. 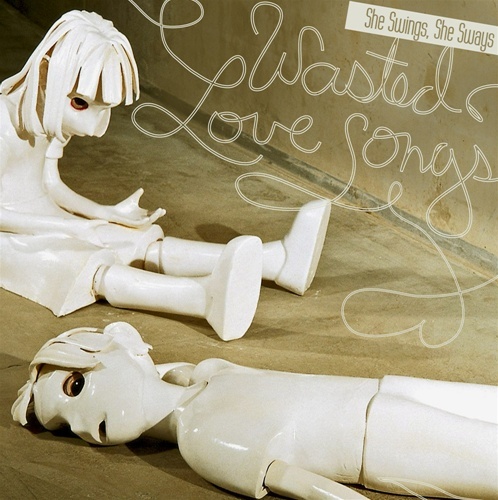 July 2008 marks the release of their first full-length record, Wasted Love Songs, which was recorded only a block from the band’s home and will be put out by Authentic Records of Des Moines. Wasted Love Songs, is truly a full-band effort; with each member contributing their own story of wasted love, or getting wasted due to unrequited love, depending on whom you ask. When the band is asked what “style” of music that they play, a common answer is “Midwestern” music. She Swings, She Sways’ range of influences is wide, combining rocking two-beat stomp, soulful lovelorn lyrics, and lilting pop melodies. “Basically, we steal the best elements of the music we like and when the six of us play together, it just comes out kind of sounding like us,” says Cory Canny. “We’ve been described as Americana, folk, pop, indie, and polka. I’m pretty certain that the older gentleman who described us as ’polka’ was heavily medicated at the time, because he also insisted that he was my real dad.” The diversity of the band is not only defined by the music. The band’s age range is 15 years; some have tattoos and piercings; others look like your average clean-cut college kids. “The individuals in our band wouldn’t typically be seen playing together in your average band. But we don’t care, partially because we grew up in a very ’image-conscious’ culture in America and we got very bored with that very early. But mostly we don’t care because we know that we look good,” says John Gordon. She Swings, She Sways is very proud of their Iowa roots. Still, they all hope to soon leave home for the long haul and take their music anywhere they can find a meal, a bed, and some open ears. We love your cd, “Wasted Love Songs”! We have played the whole thing on http://www.luver.com. And it is now in luver’s mix….so you are often on luver! When you have more stuff [old or new], send it to luver! …and could you record drops for luver? [luver is pronounced “lover.”] We need two drops. The first drop needs “you are listening to the mix on luver.com” in it. The other needs “you are listening to “Frank spins hot wax on luver.com!” Have fun and adlib! do the show on a different night.] We do it from our north Berkeley home. http://www.luver.com/underground/shamden.html. You can perform, and I’ll interview you.